It is grimly ironic that Karl Marx has been mobilised to justify the Chinese Communist Party's embrace of state-directed capitalism. On the bicentenary of the communist prophet's birth on 5 May 2018, Chinese President Xi Jinping declared that the Communist Party 'has combined the fundamental principles of Marxism with the reality of China's reform and opening up, and the nation who stood up has grown rich'. China's economic system bears no resemblance to the revolutionary overthrow of capitalism advocated in The Communist Manifesto, published in 1848. 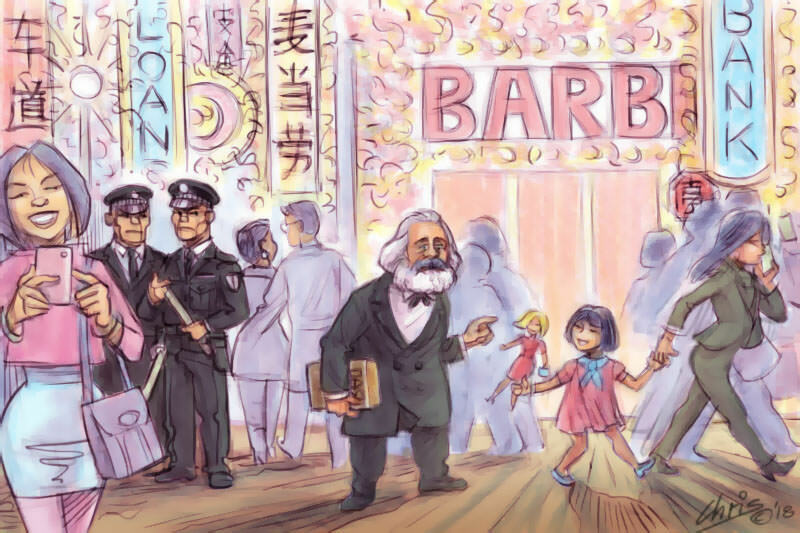 Embracing what Marx described as 'a fetish of commodities' — including the worship of the Barbie Doll, at the world's largest store dedicated to the plastic princess in Shanghai — has delivered astonishing economic growth and has lifted millions of Chinese out of poverty, as Richard McGregor acknowledged in The Party, a study of the world's most powerful political machine. Declaring that a desire to be rich is good has also yoked the Chinese Communist Party to the fortunes of the economy. From the inauguration of Deng Xiaoping's economic reforms in 1980, the Communist Party has been a captive to capitalism. As Richard McGregor observes, 'the Party's legitimacy' in the eyes of the Chinese people depends on maintaining the pillar of strong economic growth. "The contrary dissident would find no refuge in the stultified, bureaucratic conformity of Beijing, a political culture as smoothed of dissent as the tightly policed space of Tiananmen Square." Xi Jinping would have the world believe that China is Marx's spiritual home. But Marx would find no place in modern China. He would be as threatened with imprisonment and suppressed into silence as he was in Cologne, Paris and Brussels before he found refuge in the liberal tolerance of Victorian London in 1849. The contrary dissident would find no refuge in the stultified, bureaucratic conformity of Beijing, a political culture as smoothed of dissent as the tightly policed space of Tiananmen Square. Marx might at least have felt awestruck under the stunning towers of Shanghai's free trade zone. The rapacious global spread of capitalism was a phenomenon that he sought to explain to the readers of the New York Tribune. For a decade from 1853, Marx provided, in a stream of articles, a characteristically shrewd and sharp critique of the global spread of capitalism and imperialism, and not least their impact on China. Marx observed that through warfare England had forced the Chinese to import opium from India, and opened 'the Celestial Empire' to contact with the world. What would the consequences of this opening represent, Marx wondered, for England and Europe? Today, Marx would have been a fascinated observer of China's One Belt One Road initiative. The central Asia corridor of the world's largest infrastructure project stretches across the Eurasian continent towards Turkey and Europe, harnessing economic development to the global ambitions of the Chinese state. In his speech Xi Jinping recommended that 'communists should keep the habit of reading Marxism classics and learning Marxism principles'. Marx's journalism would not today survive the Chinese censor: caustically opinionated, intently curious, castigating power without a thought for political correctness. The arch critic of liberal capitalism bathed in its press freedom. In China the rebellious spirit is suffocated by the state. Industrial unrest and real trade union activism is suppressed. Campaigners for human and environmental rights are hounded and confined. The Chinese state fears the power of dissident words. In early May 2018 the poet Liu Xia, under house arrest since 2010, railed against the brutal suppression of her life and work. Her husband, Nobel Peace Prize laureate Liu Xiaobo, died in 2017. He had been imprisoned since 2009 as a consequence of human rights activism. The journalist and environmental activist Dai Qing has struggled to be published in her own country since speaking out in the 1990s against the construction of the Three Gorges Dam. Unilateral state control provides the basis of the power the Chinese Communist Party projects within the nation and beyond its borders. Marx understood the unintended consequences of arbitrary power. When the people of India rose in rebellion against their British colonial masters in 1857, Marx observed that 'it is a rule of historical retribution that its instrument be forged not by the offended, but by the offender himself'. So often reduced to dogma, Marx's subversive words still speak an uncomfortable truth to power. “But Marx would find no place in modern China. He would be as threatened with imprisonment and suppressed into silence as he was in Cologne, Paris and Brussels before he found refuge in the liberal tolerance of Victorian London in 1849.” Déjà vu: across the water from Xi Jinping’s intolerant cafeteria Marxist mainland is the liberal tolerance of Tsai Ing-Wen’s green and pleasant land where, if he wants to, Marx could bathe in a press that is free to say Marxism (not the cafeteria kind) failed. Once the faithful Marxist, Mao Tse-tung, was out of the way, the pragmatic Chinese ditched inefficient communist economics, embraced the market economy, and indeed “delivered astonishing economic growth and has lifted millions of Chinese out of poverty.” Vietnam followed China’s example with their Doi Moi economic reforms and similarly prospered. According to Qiong Zhang, head of wealth management for UBS Securities in China, China can now boast, “One billionaire is created every three weeks.” But in spite of this, and of a hundred years of Marxist/Leninist failures and the deaths of hundreds of millions, Marxism now flourishes in Western academia. Marxist historian, Eric Hobbsbawm, let the cat out of the bag when he wrote: “If the Left have to think more seriously about the new society, that does not make it any the less desirable or necessary, or the case against the present one any less compelling.” So even though everything emanating from Marxist thought has failed, there is still a “compelling” case to destroy what is known to work in the pursuit of some abstract utopia. The utopian ideal may be ethereal, but it promises a “heroic struggle” that demands sacrifice and commitment and fills empty lives with meaning. Well said, Ross. You know, I was fully on board philosophically with the Safe Schools project until one of its leading protaginists carelessly let slip (privately) that while she was happy with the progress of the program, that 'Now we just need to get rid of the racist Australian flag on top of state parliament and get a red one up there and my work is done'. Was everyone here OK with that? Is that what these people/you here want - A socialist government to replace our democratic one or was I just being fed fake news. That's when I woke up. What a crazy bloody world we live in. Let's learn from Venezuala the latest in a string of failed socialist experiments. Democratic socialism such as found in The Netherlands is one thing...Pure 'red flag' politics - God forbid it should ever come here. Of course it starts with the children and the state taking control of raising them, and controlling the family, (think Safe Schools) which in turn seems necessary if you believe that past political and religious philosophies are contaminated and there is a new brighter world awaiting anyone who will join the struggle, learn the language and totally conform. Would Marx be welcome HERE I wonder? As for China ???? Great piece, Mark. I'm always intrigued by the idea that 'Marxism' has failed. Compared to what? The Neo-Liberal hegemony of the EU? American democracy (ha ha)? The single party with two names we've ended up with in Australia? Capitalism, or 'liberal democracy' as it is sometimes known, has been a roaring success for a limited number of people in a limited number of countries. For most of the folks on this planet, it has been a comprehensive nightmare that Marxism on its worst day has never rivaled. Marx and the Chinese would get on fine. There is more that unites totalitarians than separates them. Tony, you've got to ask then, if the West, including Australia, according to your analysis, is so horrible, why are people from around the world (including socialist countries) trying to get here. Well, perhaps one day, you too will get your wish and the red flag of Marxist socialism will one day fly above our parliament houses. Our western world isn't perfect but it is doing the most for the most and we are very free. Yes it can be improved and you've recognised that about those you are critiquing, but you must see that critiquing can easily be directed the other way. It's when the critiquing becomes fanatical and then gets replaced by punches, rocks and bullets - God forbid - that we soon realise that we made a mistake by using unconsidered words, which grow into untested theories and assumptions about humanity, which then get taken up by politicians seeking more than one term, which then get made into policy, and then one day we all start asking, "how the hell did we get here?" But it's too late then, and another generation has to suffer wars or social upheaval until the pendulum swings back again and round and round and round we go. But I still seek the light of hope that seeps through the cracks that exist in everyone and everything. Tony, liberal capitalism, even the vanilla-flavoured, hobbled version we have today, has liberated the world from grinding poverty, defined as income of less than $U.S.1.50 per day. As the lefty Brookings Institute found a few years back, the penultimate halving of grinding poverty took 25 years. The last one took about 5, such that the "Millenium 2000" goal of halving world poverty by 2015 was already achieved well before 2010. There were only about half a billion in grinding poverty by 2010, and that number has probably come down significantly since then. "Unprecedented in history", the BI called it. And it had nothing to do with foreign aid, which if anything decreased over the relevant period per capita: the BI put the dive in poverty down to that much-maligned phenomenon: "globalization" - ie the spreading of trade and the market economy. So, yes, Marx would be really cheesed-off with China, notwithstanding her persisting gross abuses of human rights (which he wouldn't bat an eye at anyway - his materialist philosophy doesn't allow for any ethics whatsoever, let alone human rights). China's awkward slouch back to the market, and the massive material benefits this has reaped for her own people, offers further confirmation that Marx's theory is dangerously daft. Marx’s ‘materialist philosophy doesn't allow for any ethics whatsoever’ but capitalism does? Pull the other one AO. Sorry AO, I meant HH. GM: let’s agree that there’s a categorical distinction between a. the metaphysical philosophy of “materialism” (Marx, Engels, Lenin, Stalin, et al) and b. the lifestyle choice of “materialism” which prioritises material acquisition and enjoyment, a choice which anyone – businessman, businessman’s wife, politician, politician’s wife, poor person, AFL footballer, Pope, greenie activist, etc, may happen to adopt. Marxist philosophy precludes ethics. Marx, as we know, insisted on dialectical materialism. Any ethical/religious/etc view was purely an epiphenomenon – ie, not in any way based on objective reality. How does “capitalism” fit in here? Well, it depends on how one defines it. I (among many others) would say that at its base, “capitalism” is an economic system that acknowledges the human rights to life and property, with the consequent right to trade one’s goods for money or barter with anyone one pleases. I fail to see how "capitalism" so defined reduces to “materialism” in either sense a. or b. This is a very important article by Dt Mark Hearn. I agree with him that Karl Marx would not be at home in today's People's Republic of China (PRC). With the leadership of the Chinese Communist Party adopting capitalist strategies, the number of super wealthy people has risen exponentially. A CNBC article of 24.2.2016 reported that China now has the most billionaires in the world It also quoted The Hurun Report which said that China then had 568 billionaires compared to the US's 535. (https://www.cnbc.com/2016/02/24/china-has-more-billionaires-than-us-report.html) This has led to a great disparity between the very wealthy and the poorest Chinese. I think it was good that Mark also pointed out that the point of Marx's work was to show how ordinary people and the environment were being exploited by the very wealthy capitalists. During the neoliberal stage of capitalism, this situation has become much worse with the world facing environmental crises and much of the world's population living in dire poverty and succumbing to easily treatable diseases. The poorest 40 percent of the world’s population accounts for 5 percent of global income. The richest 20 percent accounts for three-quarters of world income. (http://www.globalissues.org/article/26/poverty-facts-and-stats) Karl Marx was a strong believer in word-wide social justice and attempted to expose injustices of his day and suggesting a way forward so that all could share the world's resources fairly. It is tragic that Stalinism has given the struggle for justice by socialists such a bad name. Andrew, it's not just Stalinism the has given socialism a bad name: Marx, the father of modern socialism, got it wrong from the start by his refusal to acknowledge anything other than materialistic aspiration and possibility for humanity. John, have you actually read Engels' 'Condition of the Working Class in England in 1844'? Can you honestly say that there was anything other than 'materialistic aspiration' in the capitalists of that time? Or in the God-fearing merchants who put together the East India Company? Or in the bankers in our own time that built the house of cards that became the GFC? Yes, Ginger, I have, along with Blake's "London", with its scathing condemnation of those responsible for "the mind-forg'd manacles" and their rapaciously materialistic outlook. However, I don't see that it is a prescribed requirement of capitalist ideology to deny the existence of God, Creator of the human soul and the Source of human spirituality, as a prerequisite for human fulfillment.